Seenu, or Addu Atoll, is the southernmost atoll in the Maldives. The capital of Seenu is Hithadhoo and is the second most populated city after Malé. 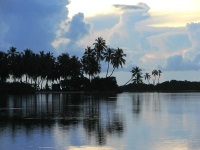 The local Addu people distance themselves from the inhabitants of the capital and are strongly independent. Seenu is the best base from which to visit the traditional island communities and catch a glimpse of their lifestyles while on holiday. The main resort, Equator Village, offers a variety of watersports including scuba diving, deep sea fishing, sailing, and snorkelling, and a number of land-based activities like squash, tennis, bicycling, volleyball, and more. The resort has a coffee shop, disco, and spa. What sets Equator Village apart is its unique cultural aspect. There is a souvenir shop outside the hotel but Equator Village is not a shopping destination. Those keen to trawl the local markets can ask for advice on where to go at the reception, and enjoy an authentic Maldivian shopping spree. Although very scenic, this resort doesn't have the culinary scope of many of the luxury resorts in the Maldives. There is one main restaurant which serves international staples and various Asian cuisines, and room service is only available if guests are sick. There is also a bar which is perfect for relaxing cocktails. Like the restaurant scene, the nightlife at Equator Village is simple and understated, the main entertainment consisting of a disco dance once a week. The resort doesn't skimp on activities. It offers scuba diving, snorkelling, sailing, island hopping excursions, night fishing, a spa for luxury treatments, table tennis, volleyball, badminton, tennis, billiards, darts, mountain biking, and squash. People of all ages will find plenty to do. Equator Village is not a luxury resort and gives more of a taste of the 'real Maldives' than most, which appeals to some visitors and displeases others.